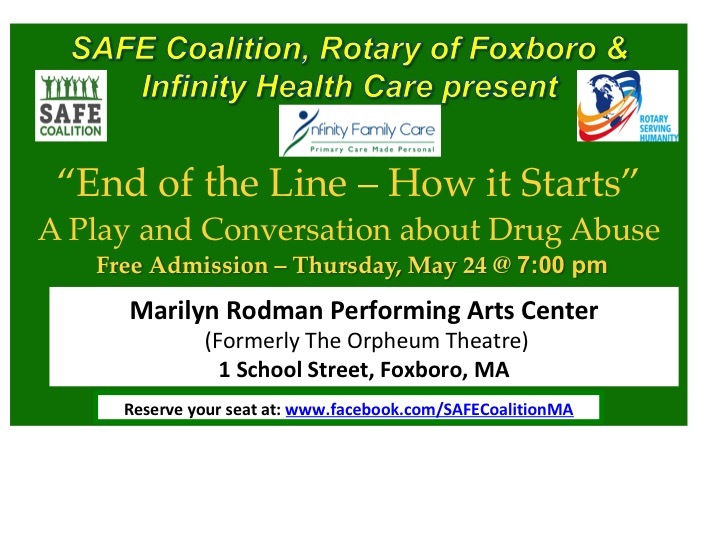 The SAFE Coalition, with sponsorship by the Rotary Club of Foxboro and Infinity Family Care, PC of Mansfield, is pleased to present a play entitled ‘End of the Line – How it Starts.” The program is intended to help our community bring addiction into the light and to talk about it. Improbable Players will perform “End of the Line - How it starts,” a short play followed by a talkback and Q& and A. 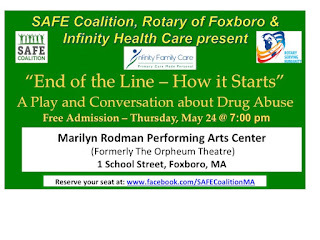 Based on true stories, the play is performed by actors in long-term recovery. Through education and reducing stigma, their mission is to stop addiction before it starts and help end the opioid epidemic. The show is appropriate for anyone 6th grade and up.